Max Horsepower:200 hp Beam:102in Dry Weight:1850lbs Max Persons: 9 Interior Depth:27in Max Capacity: 1270lbs Fuel Capacity: 40gal Length20'10" Transom Height:20in Tube Diameter:25 Still In Shrink Wrap! Max HP 250 Third Tube HP 250 Fuel capacity 60 (gal) Overall length 24'10 Beam 102" Weight (lbs) 2525 Fence height 27" Transom height 25" Tube diameter 25" Aluminum gauge .100" Starcraft pontoon boat innovation continues with the all-new SLS series, featuring HMX tubes. With strategically placed strakes, HMX tubes give you better lift, less surface drag, increased speed, faster planing and a tighter turning radius. In short, it’s one exciting ride. Max Horsepower 200 hp Beam 102 in Dry Weight 2715 lbs Max Persons 12 Interior Depth 30 in Transom Width 94 in Max Capacity 1700 lbs Fuel Capacity 44 gal Length 20'4" Package Length 25'11" Package Weight 3595 Transom Height 20 in Deadrise at Transom 13deg deg Wide open spaces. In the expansive, open floor plan of the Limited Single-Console Outboard, there’s something for everyone. Whether you’re dropping anchor or dropping the throttle, two different model options let you pick your passion. Feel like dropping your line in the water? Check out the 2000 OB with two fish seats, livewells and rod holders. Max Horsepower 200 hp Beam 102 iN Dry Weight 2715 lbs Max Persons 12 Interior Depth 30 in Transom Width 94 in Max Capacity 1700 lbs Fuel Capacity 44 gal Length 21'10" Package Length 25'11"Package Weight 3595 Transom Height 25 in Deadrise at Transom 13 deg This big water fun boat series is rigged for full days out in a wide range of conditions. 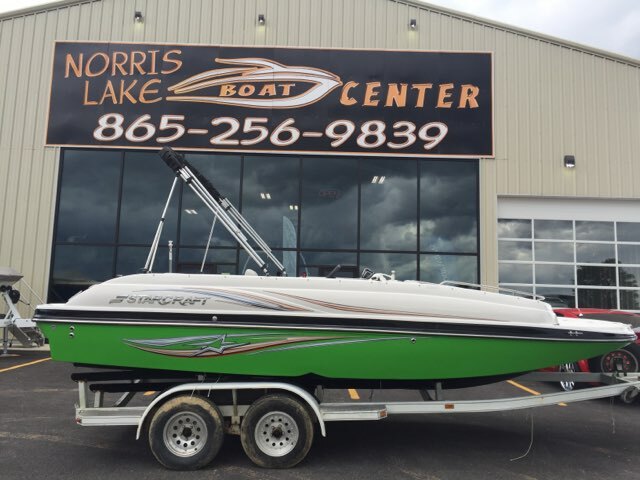 Length: 26' 10" Beam: 102"
Capacity: 2710 Fence Height: 27"
Transom Height: 25" Tube Diameter: 25"
Black SLS 5, super sport package, helix 5 gps, underwater lights, pylon ski tow, performance shield, grey sea weave flooring, super sport orange graphics, Yamaha prerig. With Mercury 250hp………Max HP 250 Third Tube HP 250 Fuel capacity 60 (gal) Overall length 24'10 Beam 102" Weight (lbs) 2525 Fence height 27" Transom height 25" Tube diameter 25" Aluminum gauge .100" Starcraft pontoon boat innovation continues with the all-new SLS series, featuring HMX tubes. With strategically placed strakes, HMX tubes give you better lift, less surface drag, increased speed, faster planing and a tighter turning radius. In short, it’s one exciting ride. With the MX 23 CP pontoon boat, you're sure to be turning heads. Cruise across the lake or fly across it with the help of the award winning HMX performance strakes that are optional on any MX pontoon boat. With sport car like handling, this boat is the thrill ride you've been craving. 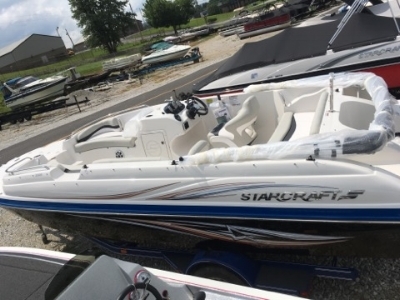 With the Starcraft MX 25 DL pontoon boat, you're getting top of the line comfort and a cutting edge layout. With a rear dual lounger that can be converted into a double bench, you can lounge or chat with friends in the flip of a head rest. Plus, with luxurious seating and a raised helm, everyone will be able to relax in comfort with the MX 25 DL. Max HP 250 Third Tube HP 250 Fuel capacity 60 (gal) Overall length 24'10 Beam 102" Weight (lbs) 2525 Fence height 27" Transom height 25" Tube diameter 25" Aluminum gauge .100"